World Archeology: Petra monuments orientated according to celestial events. Petra monuments orientated according to celestial events. During the winter solstice, the sun is filtered into the Monastery at Petra, Jordan, illuminating the podium of a deity. Just at this moment, the silhouette of the mountain opposite draws the head of a lion, a sacred animal. 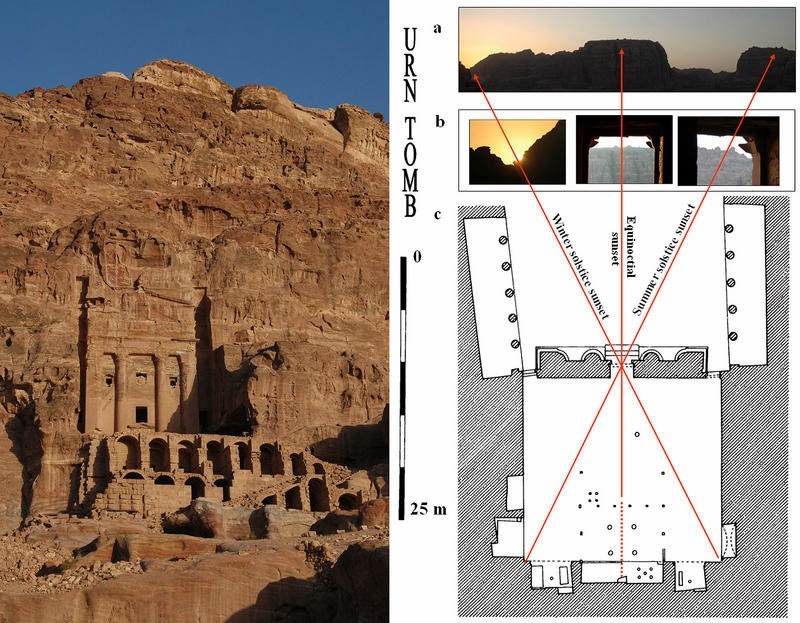 These are examples from a study where researchers from Instituto de Astrofisica de Canarias and CSIC (Spain) showed how celestial events influenced the orientation of the great constructions of the Nabataeans. The movement of the Sun in the skies of Petra determined the way in which the monuments of this and other Natabean cities were erected. This is according to a statistical analysis on the spatial position of their palaces, temples and tombs carried out by scientists from Instituto de Astrofisica de Canarias (IAC) and CSIC, Spain, and the University of Perugia (Italy). The results, published by the Nexus Network Journal, indicate that those great buildings were erected bearing in mind the equinoxes, solstices and other astronomical events that determined the Nabataean religion. The Nabataeans prospered in the first century BC and the first century AD in what is now Jordan and neighbouring countries. 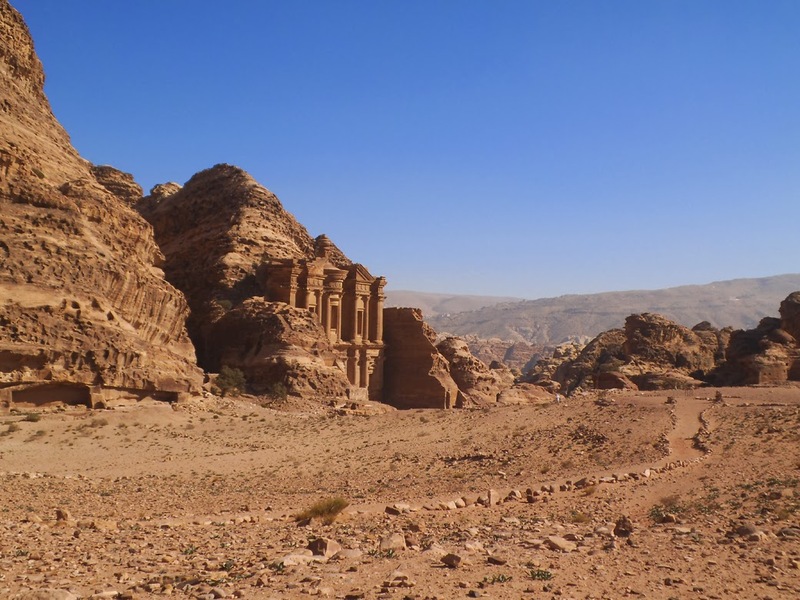 “The Nabataean monuments are marvellous laboratories where landscape features and the events of the sun, moon and other stars interact,” Juan Antonio Belmonte, researcher of IAC and coordinator of the study, stressed to SINC. “The astronomical orientations were often part of an elaborate plan,” he added “and, possibly, a mark of the astral nature of their religion, which showed incredible ‘hierophanies’ or demonstrations of the sacred on monuments related to cultic times and worship“. A clear example is seen in Ad Deir, the Monastery at Petra. During the winter solstice, the light of the setting sun entering through the gate of the monument illuminates the sacred motab. It is a podium where some stone blocks, which represent divinities such as the god Dushara, are placed. “The effect is spectacular, and would have only been observable during the few days closest to this solstice,” commented Belmonte, who also emphasises how, just in this moment, another curious phenomenon is produced. As observed from the motab itself, the setting of the sun recreates the aspect of the head of a lion, the animal of the Nabataean goddess Al Uzza, on the opposite rocks. Mathematical calculations also show the astronomical plan that the Urn Tomb follows, another famous monument where king Malichus II is thought to be buried. Its main gate is centred with its environment according to the equinox sunset, when the day equals the night, and the solar rays during the summer and winter solstices establish the two interior corners of the building..
“This amazing set of three alignments within the plan of the tomb, in combination with significant features in the distant horizon can hardly be ascribed to chance,” underlined Belmonte. “We consider that it is a deliberate attempt to convert the hall of the Urn Tomb into a type of time-keeping device“. 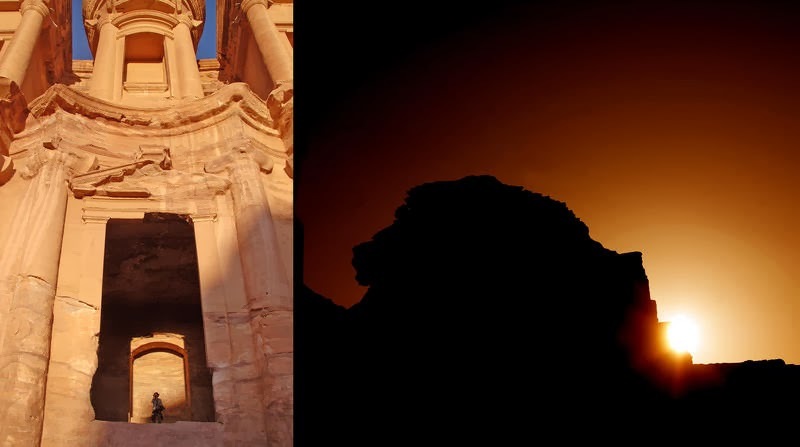 When in 446 AD the Christian Bishop Jason converted the Urn Tomb into the Cathedral of Petra, the solsticial markers also served as a reference in determining Christmas Eve (24 December) and St. John the Baptist (24 June), the date on which the monument was consecrated to the new religion.